Christina and I went to Vientiane, the capital of Laos, for four days and it was lovely. While it was my first time to cross customs into Laos (yay for a pretty new visa in my passport!) I landed in Vientiane once before. It was nice to see outside Wattay International Airport this time! I’d heard Vientiane was a quiet town, which it indeed turned out to be – perfect for a little chilled down time. We basically did nothing, just wander around and chat while doing a little eating and a little shopping. And yet somehow we managed to get a little taste of Vientiane – which leaves me really wanting to go back and visit Laos for real in the future. Part of our taste of Vientiane was literal taste. We certainly enjoyed a small French cafe – amazing bread and pastry! But we did also try a little Laotian food. 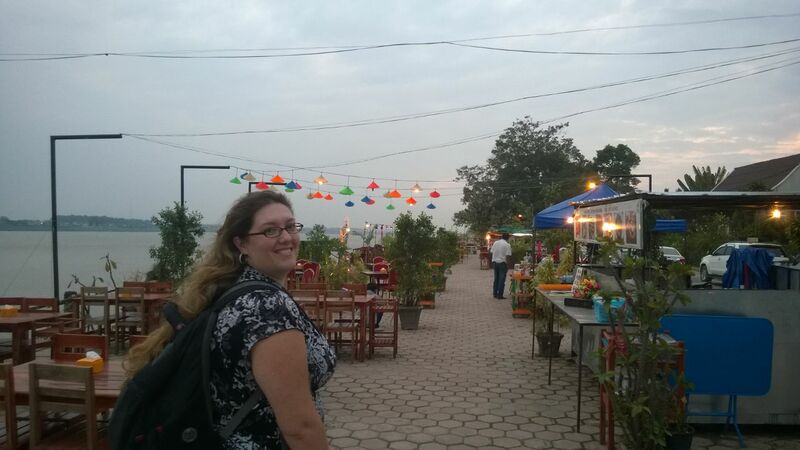 On our first night we wandered through the night market and a series of small eateries on the banks of the Mekong. This is the third country in which I’ve walked (and eaten) alongside the Mekong. We picked a restaurant, where I tried the local beer (which was not bad) and we ate thin cut beef with lemongrass and ginger and an asparagus/prawn dish. When I paid the bill I met the bar’s Scottish owner and the Lao lady who does the cooking – they were talking about the amazing asparagus they’d got from Vietnam, so I guess we chose well! The next night we ate at a fancier restaurant further down the river. We ate on an open air balcony where lovely colourful lanterns hung from beautiful big trees between us and the Mekong. We had some great duck but the highlight was definitely the Laotian snacks – awesome sausage with ground coriander in the mix, honey glazed grilled pork, and the standout: river weed. Seeing it on the list I really thought we’d try a bit to say we’d eaten it and that would be it, but it was awesome! It’s seaweed basically, but out of the Mekong river – hence river weed – which had been dried and fried, with sesame and garlic. It was crunchy and yummy! Finally, there was street food – of course! We bought some little snacks from a lady on the street, cooking hemispheres of a coconut batter in little cast iron molds. Three balls made from hemispheres sprinkled with savoury shallots and then put together – crunchy crust and squishy inside. She put them in a little box made of banana leaves and held together with a toothpick, and gave us a little bag with sugar to sprinkle. Simple but yummy. We did a lot of window shopping and a little actual shopping. There were a lot of lovely handicrafts far too expensive for us to consider buying but very interesting to look at nonetheless. Hundreds of beautiful silk scarves, fine and soft, or heavily embellished. There were woven and embroidered textiles, heavy and bright. There were all sorts of things made of silver, wood, water buffalo horn, and much more. I loved wandering around town (even if my knees weren’t so impressed with it). There are lovely big trees everywhere. I loved looking up at them – so tall, so wide, such big roots. There are lots of frangipanis – one of my favourite flowers. I spent most of one day with a blossom in my hair. There are interesting looking older colonial buildings. We actually wandered into the tiny national library out of sheer curiosity. There are temples everywhere, in some ways like temples throughout South East Asia, but different as well. There were mosaic backgrounds made of glittery green glass on some – that was something I hadn’t seen before.